On December 25, 1966 promotor Ed FRANCIS presented his forst professional wrestling card to be held on christmas day, featuring a grudge match between former tag team partners Johnny Barend vs. Ripper Collins. 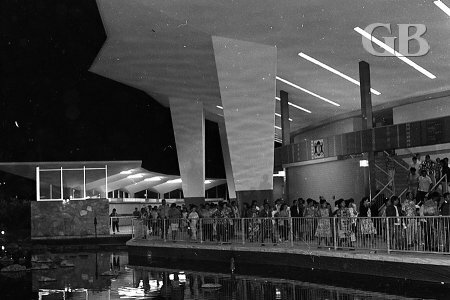 Over 7, 00 fans fans attended the card held at the Honolulu International Center arena. Fans arrive early to the HIC arena in anticipation of the big matches. 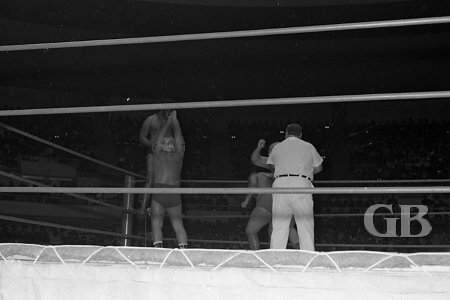 In the opening match Harry Fujiwara battled to a draw with Beaureguard, in other matches Tarzan Tyler substituting for The Mongolian Stomper drew with Karl Gotch. Beauregarde slams Harry Fujiwara's (Mr. Fuji) face into the mat. In a tag team match Neff Maiava and Kongozan beat The Mighty Atlas and Steve Stanlee. Maiava pinned pinned Atlas with head butts, a roll over and a press for the win. Steve Stanlee signs autographs for fans. Kongozan goes through his pre-match sumo exercises next to his partner, Neff Maiava. 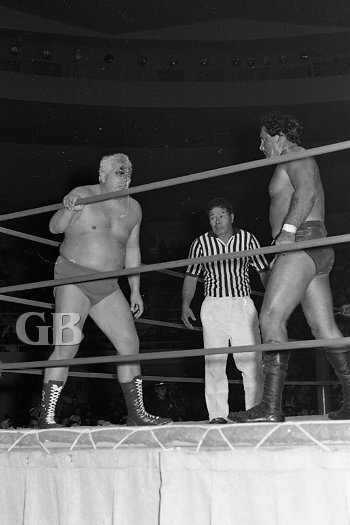 Stanlee works over Maiava in the corner. 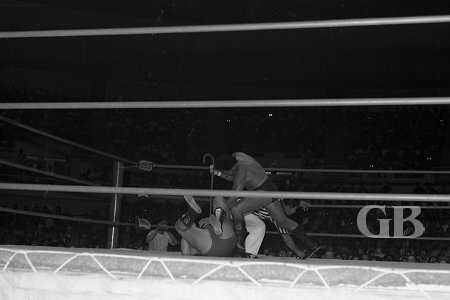 Referee Frank Merrill tries to regain control of the match as all 4 wrestlers battle in the ring. 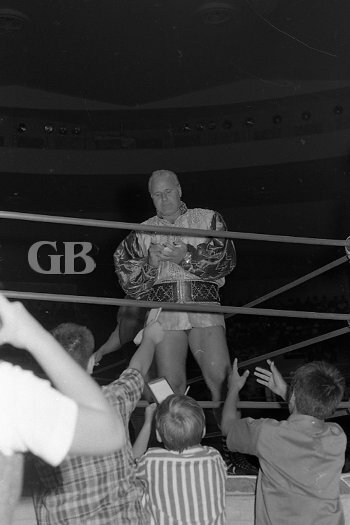 The first main event saw Ray Stevens and Pat Patterson returning to Honolulu for the first time in several months put up their world tag team crown against Jim Hady and The Missing Link. The first fall went to Hady and The Link, when Hady clamped on an octopus hold on Stevens for a submission hold. The next fall had Stevens even up the match with a "bomb away." Patterson and Stevens retained their world tag team titles when Patterson used a drop kick and a pin on the Missing link for the third. 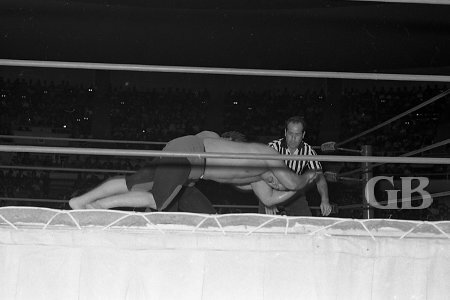 Ray Stevens get thrown into his partner Pat Patterson in the corner. 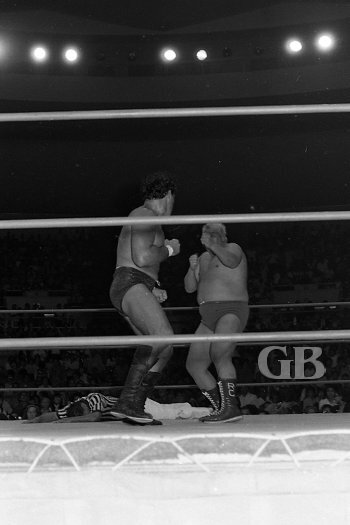 Pampero Firpo, AKA The Missing Link, slams Ray Stevens into the ring post. Jim Hady applies the Abdominal Stretch on Stevens as the Link crushes Patterson with his Bear Hug. Both Patterson and Stevens take a breather during their tough match. Once again, Jim Hady ratchets the Abdominal Stretch onto Ray Stevens. The second main event was a grudge match between Johnny Barend and Ripper Collins. Through out the year 1966 Barend and Collins were the top tag team in Hawaii . 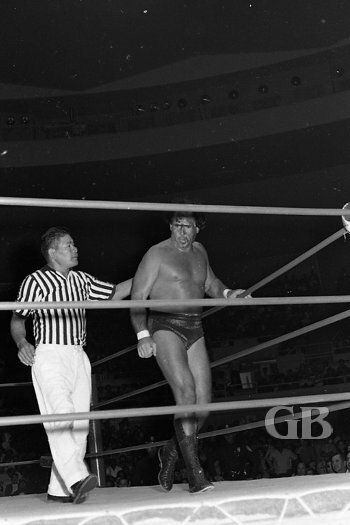 Earlier in the month of December 1966, Collins was wrestling in a tv studio match when his valet Beaureguard went to hit Collins' opponent with a cane and missed and instead hit Collins. The angered Collins who began slapping Beaureguard around in the ring. As this was happening Johnny Barend entered the ring to clam Collins down, but instead the two on into a agrugment and started fighting with each other. Ripper Collins confronts Johnny Barend as referee Wally Tsutsumi stands by. 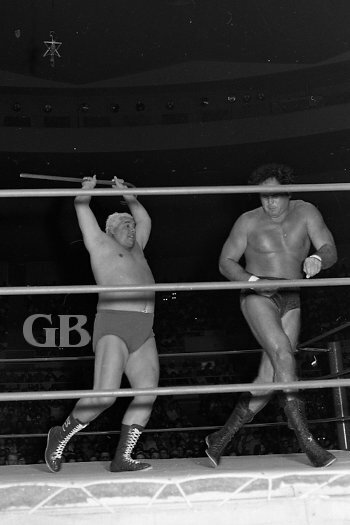 Collins attacks Barend with Johnny's cane. Johnny Barend sizes up a bleeding and drooling Ripper Collins. Now himself bleeding, Barend stalks the ring perimeter waiting to attack Collins. Barend goes after Collins with his cane as the ref hurries to get up off the mat. Both wrestlers continue on despite the referee being knocked out in the middle of the ring.